Sorry but I have to go into a hold status. Remember PIctures!!! I usally take so many photos it hurts. Here is my start picture for my campaign conribution.The AM stuff cost more then the model did !! 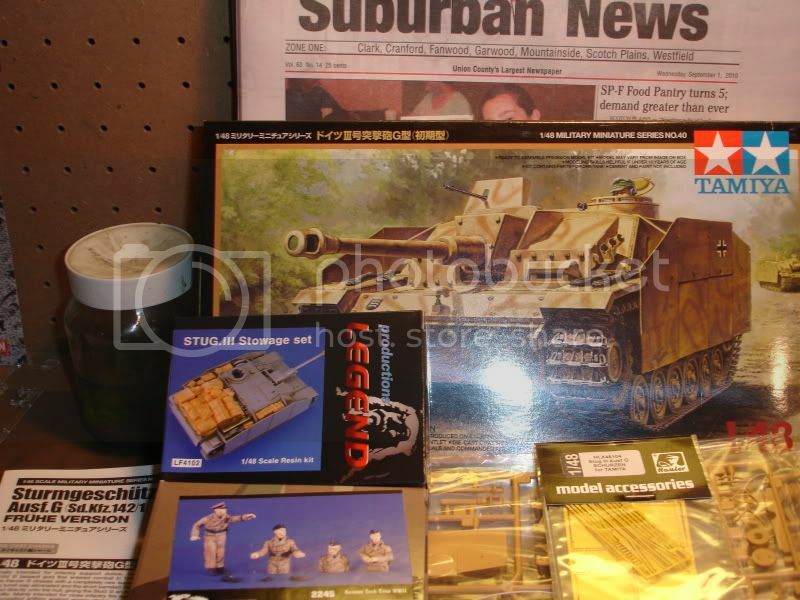 But it's more stuff then I usually do,and I wanted to go for it since it's a small project.No start date yet as I must complete my Jagdpanzer IV for the Workhorse Campaign,but I can't wait to get started,as their are a lot of great subjects on tap,as well as some great modelers participating. Congratulations for being theearly bird gluing parts here . I will follow your build with interest as I also want to make one of those AFV Club Late Tigers soon. Are you sure you have to purchase a new one for the pic? One pic with the untouched parts is not valid too?... Whay not to ask Stefan before taking other actions? I just moved, but I’ll be ready to start my project in a few days. Looks like it is going to be a popular campaign, this will be my 3rd but I will finish this time! I think Bob is just looking for an excuse to buy another kit. I've been waiting for the start for some time. A little bit of progress made. I have primered everything and started on the assembly. If all goes well I might enter this in the contest at Kalamazoo on the 11th. 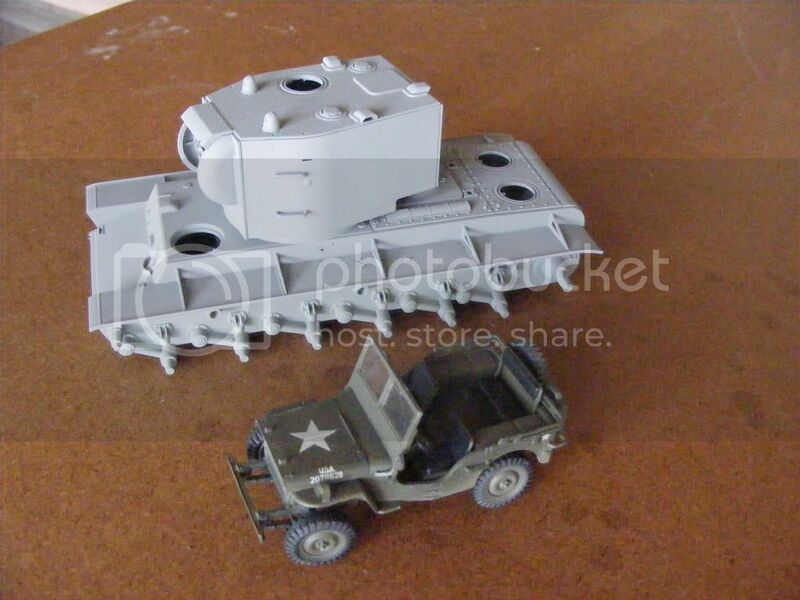 And with the old Bandai 1/48 jeep to give an indication of the size of this beast. Some progress made. The primer is from a big spray can from the hardware store. The pre-shading is done with Model Master Burnt Umber enamel. Wow, this campaign is taking off fast. I got inspired and stayed up late to do some work on this guy. These builds are really coming along, nice work guys! 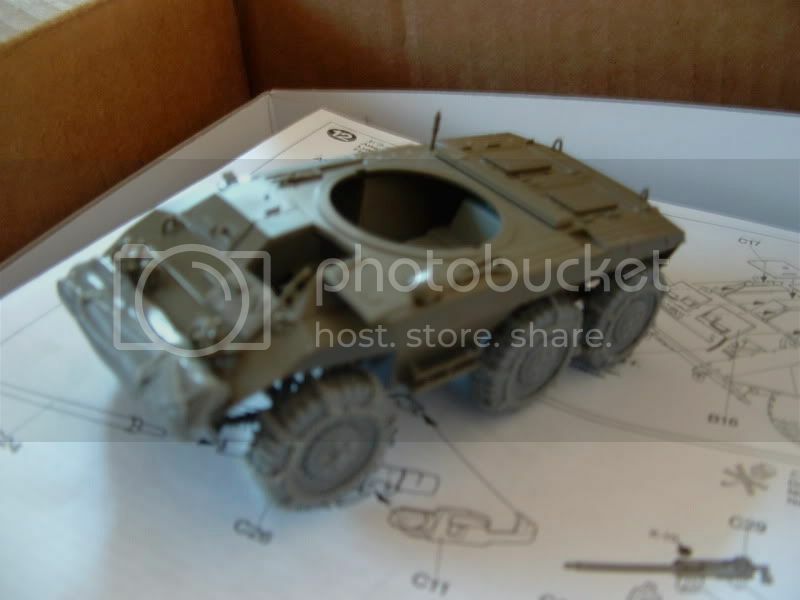 If things go well I may add another build for this campaign, either Tamiya's Panzer III Ausf. L or HobbyBoss' KV-1s Ehkranami. Removed by original poster on 09/03/10 - 10:02:39 (GMT). Good work! Your builds are progressing quickly. John, no concern for the pics because they are fine. Ed, at the moment I am finishing one Tamiya KV-2 too. Greg, I like how the M8 looks with those chained wheels. 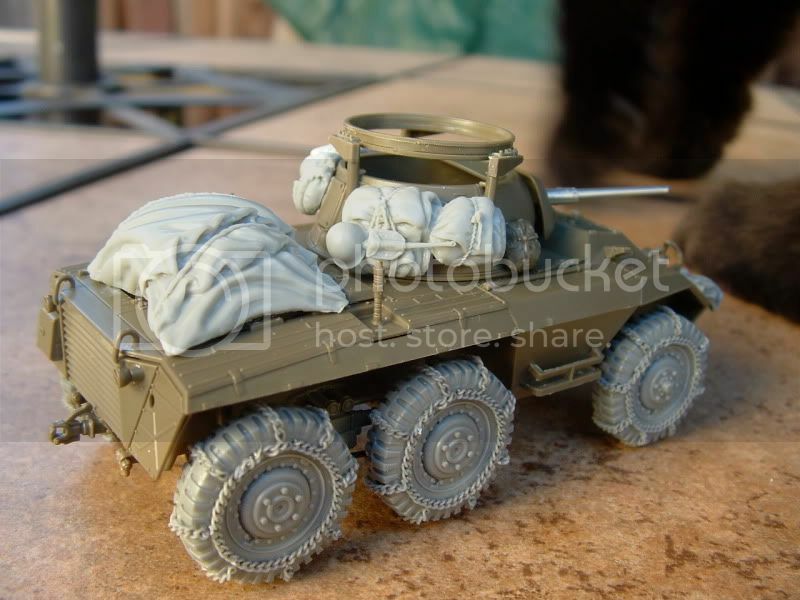 Right I've decided on a model It's an AEC Matador MAT by an unknown manufacturer but I know its not a Hart kit and a Hart 5.5inch Howitzer, pictured in front of the last post on the site for dating purposes. All I need to do now is actually get down and start to build it!! Progress looks good so far for everyone else. Hi everybody, this will be my entry for this campaign.
" Failure is not an option, It comes bundled with the software. " Hello,That's the same combo I used for the hummer campaign.It's a nice kit,But be careful of those smoke dischargers,they break real easy,as does the front grill.Good luck on your entry. I've been considering the same build for a future point in time. Looks like a good build. And thanks for the insight Anthony. Hi everyone, I like the variety of kits going into this campaign. Here's some more progress. 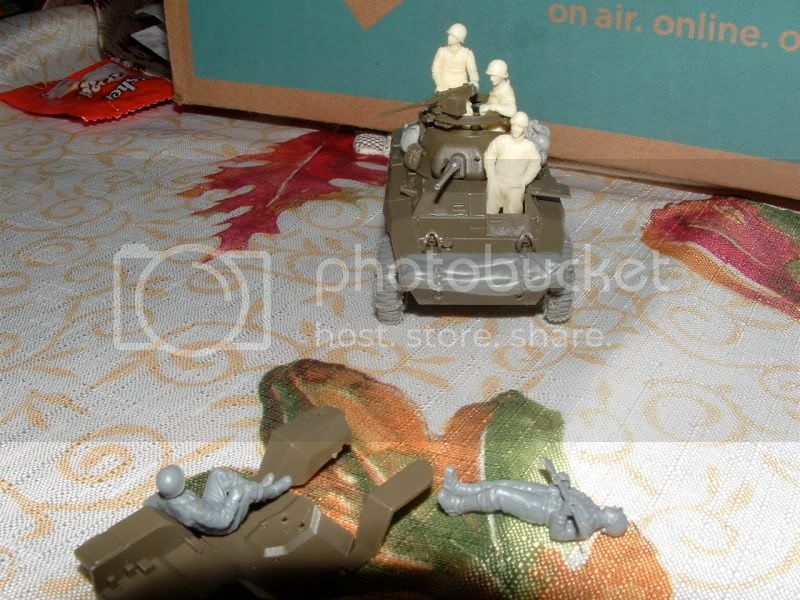 I decided my scene will be from the Battle of the Bulge and include the US jeep with Germans in (tamiya figs) US uniforms. The M8 driver is a little on the large side, but I think he may be ok??? or maybe find a Tamiya driver ? Wow! This campaign has really taken off! Thanks fort he enthusiasm guys!! Jeremy: The tick box is just a symbol added in Excel. You can post a pic of just the kit ort he kit with the goodies. The idea is to see that you haven’t started yet. Zon: Though not a German modeller, I’ve always had a soft spot for the Pz III variants. The campaign gallery is for the final pics only. The others just have to be posted in this thread. 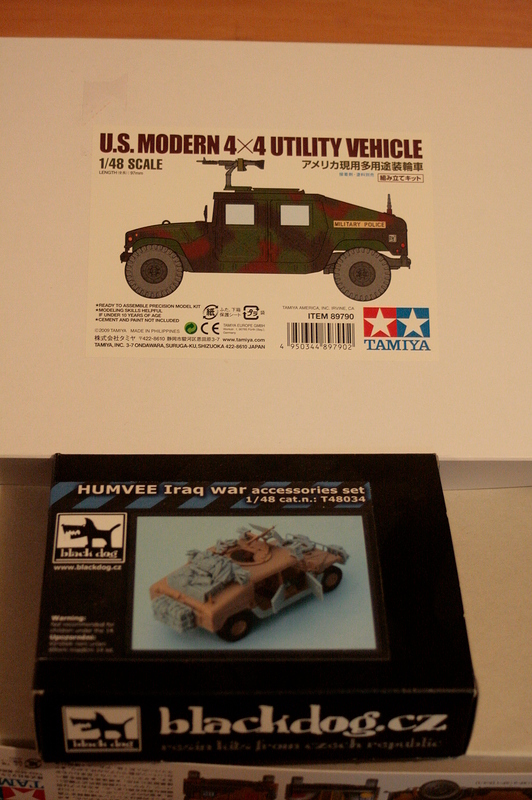 John: Looking forward to see the AFV-Club kit compared to the Tamiya example. Nice progress so far. 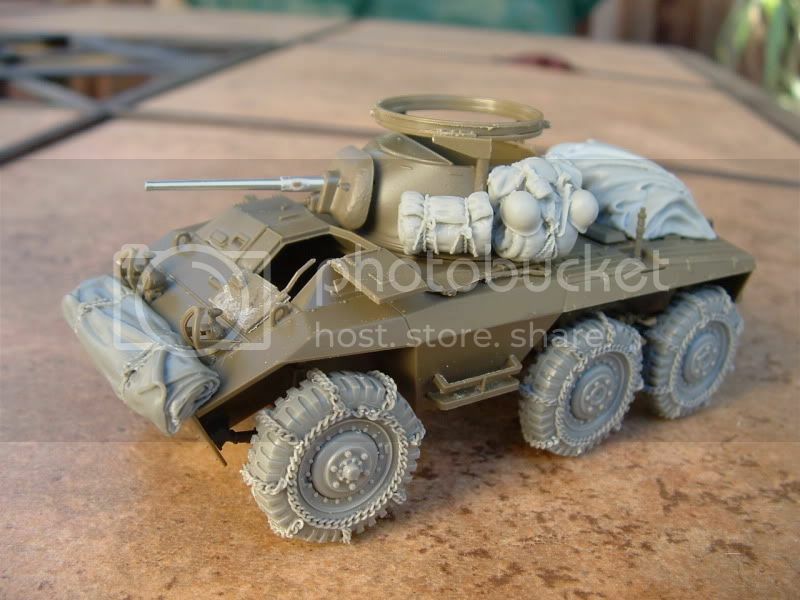 Looks more like 1/35 detail wise. Are you happy with the Zimm? Lu: Thanks for holding the fort in my absence. Looking forward to seeing your skills! Leo: From the way you describe it you plan on tearing the old kit mostly apart and rebuild it? If that’s the case I think we should let it through. What does everyone else think? Why don’t you post a pic of everything and we’ll see. Bob	: No problem, as long as there is no glue on it yet, why don’t you take a pic of it as of now and we’ll let it count. On the other hand, any excuse to get another kit, right? Greg: Nice progress! Welcome to the allied side of the campaign. The M8 is just a cool looking vehicle. How will you make sure everyone will know the crew is German in US uniforms and not just US? Allan: Allan, nice choice. Definitely something different. This is a white metal kit, right? Marc: Good to see something modern as well. Are there any modern figures available? The updated list should follow shortly. Hi Dangeroo,Must say Im well happy with the Zim,saves me a lot of work.I have only encountered one problem so far and this maybe my mistake as its my first small scale kit.The front head light the little location lug that fits it to the braket melted when i glued it (i use humbrol liquid poly) guess it may have been better if i had used cryo.well you live and learn.I looked at a crew for the beast but their so small my old eyes are not that hot anymore I need a magnifyer for 1/35th may have to do her shut up . 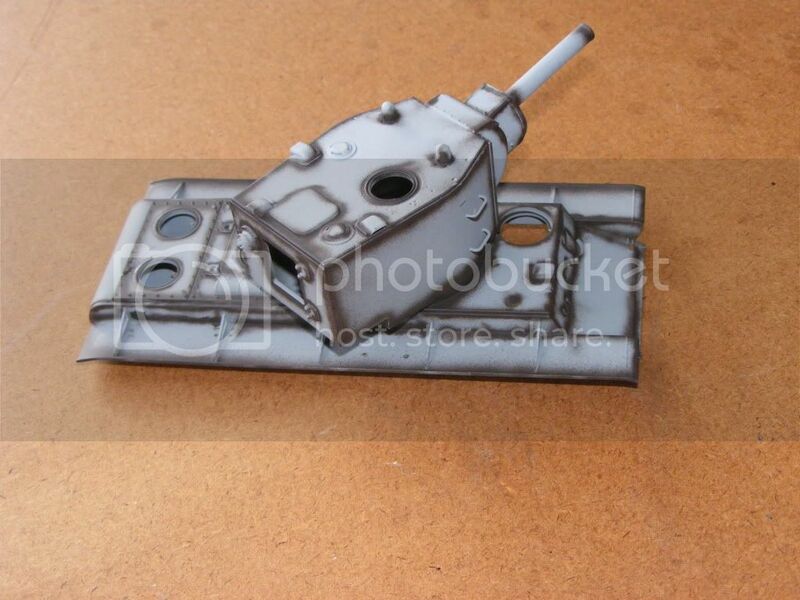 Here's the pre-start picture for my Tamiya Cromwell. Out of the box for me, though I may think about a simple base later on if things go well. My first time with 1/48th, a step up from Braille Scale. Being new to the larger scales I was a bit surprised by the die-cast hull. I can see it is more rigid and the extra weight is quite pleasing but are there any particular modelling advantages ? 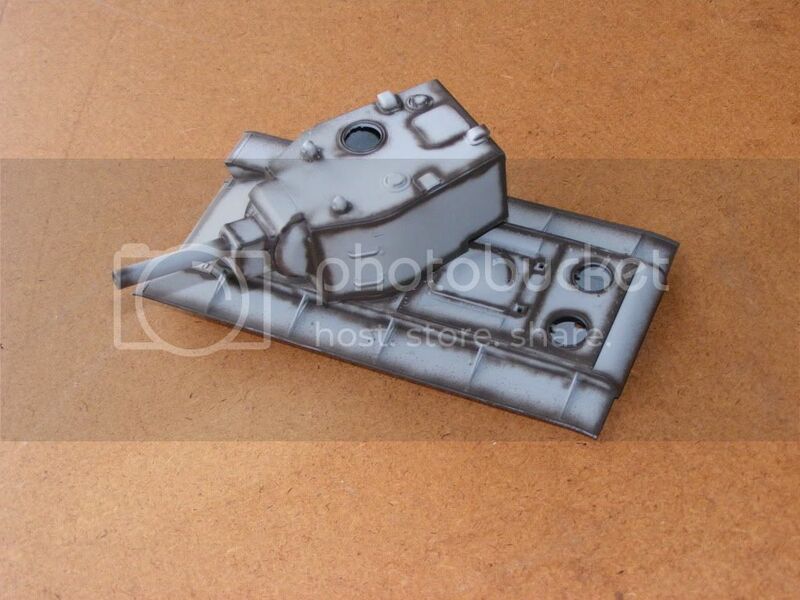 Also I presume people just use super-glue when attaching plastic parts to the die-cast hull or do you need an epoxy ? The primer seems pretty well bonded to the metal, do people normally remove the primer to obtain a secure bond to the metal surface or this generally unnecessary ? 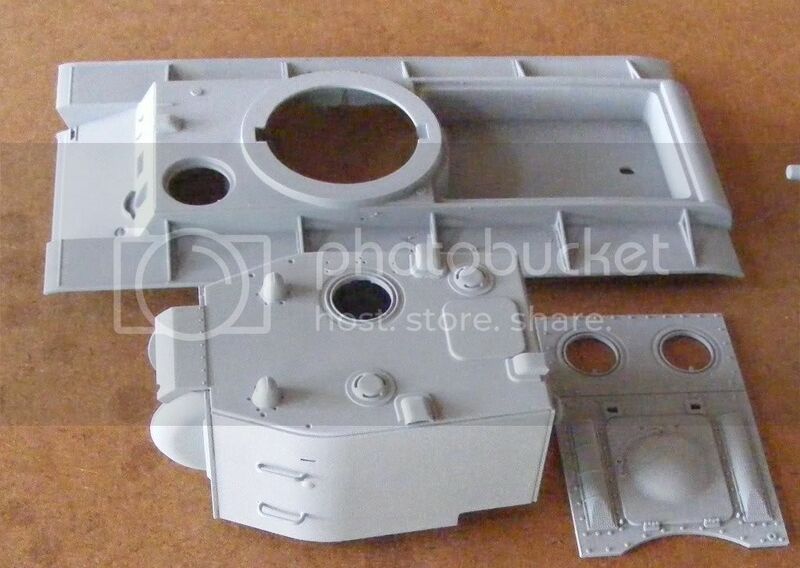 Yes its a very old now unavailable white metal kit, I've been looking for a reason to build it! Its quite accurate but it does need a bit of tinkering with to refine some of the detail. I'll get the basics together and take some more pics before I start detailing it.